Rachel Nolan and Steven Farrell’s weekend house is located a couple of blocks from the beach on Australia’s Mornington Peninsula. Built with passive principles in mind, the low-slung structure features double-thick brick walls for thermal massing. 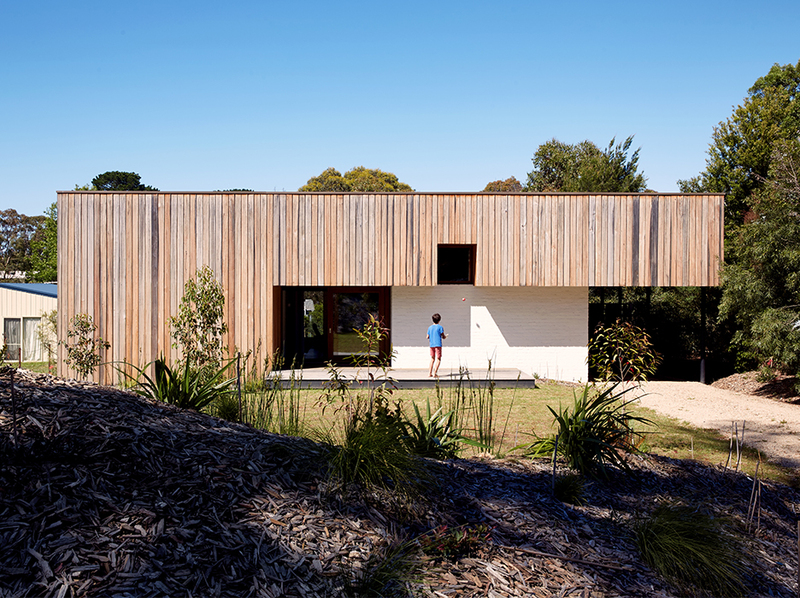 The vertical wood cladding is unfinished spotted gum, a local timber. A no-fuss sensibility permeates the house. For example, the utilitarian kitchen has laminate cabinets, a stainless-steel countertop, and a Miele stove and dishwasher. The refrigerator is by Fisher & Paykel. No. 18 chairs from Thonet and a reclaimed-hardwood table are stationed atop a vintage Persian soumak rug from Turkey. To instill a soft juxtaposition to the brick and concrete in the house, Nolan specified Hycraft’s Carramar wool carpet in the living area. Set a step down, the “pit,” as Nolan refers to it, receives the low winter sun but is shielded from harsh summer rays by the deep eaves. The ledge becomes a casual seating area. “The idea is not needing too much furniture for the house to work,” Nolan says. The sofa is from Melbourne’s Jardan, the floor lamp is Ikea, and the rocking chair is vintage. In winter, the family often gathers around the Nectre wood stove, the sole heating element in the house. Made from Tasmanian oak, the bunk beds, covered in Kivet duvets by Marimekko, can accommodate four. A Hunter Pacific fan cools the master bedroom, which has a custom hardwood bed. Nolan and her buisness partner, Patrick Kennedy, strove for a practical structure that reads as a vacation house. They opted for prototypical materials, like cinder blocks for a privacy screen, to hit that note. “It has an association with old beach houses and public buildings at the shore,” Nolan says. After trying different self-supporting configurations, they chose a zigzag pattern. The wall shields the courtyard from wind and doubles as a step for gutter maintenance. During parties, the family likes to place candles into the recesses. “That wall’s got a little bit of poetry, but it’s also doing a few jobs as well. The house has three outdoor deck areas. A table made of recycled hardwood from Flinders Pier is stationed in the central courtyard where Nolan and her family frequently take their meals. Interior floors are concrete: easy to maintain and virtually indestructible. The appeal of a getaway just an hour’s drive south of bustling Melbourne has lured many to Merricks Beach, a small seaside community on Australia’s Mornington Peninsula. Originally farmland, the area experienced a brief building boom in the 1960s, when vacation homes sprouted among the dirt roads and gum trees. Little has been developed since then, and the enclave retains its pastoral appeal; few houses and even fewer vacant lots end up on the market. So when architect Rachel Nolan and her husband, Steven Farrell—longtime visitors to the area—discovered an empty parcel in 2010, they immediately scooped it up and hatched plans to build a modest weekend retreat. Nolan and her business partner, Patrick Kennedy, established their Melbourne practice, Kennedy Nolan, 16 years ago and have since developed a diverse portfolio of projects, ranging from residences and schoolyards to mixed-use developments. Their work expresses the modernist principles of rationality, utility, and sensitivity to location. When it came to designing a vacation home of Nolan’s own, those principles remained paramount. Beyond the intangible, the house needed to fulfill certain practical criteria. It had to be inexpensive to build, easy to maintain, and durable enough to withstand heavy use. Nolan and Farrell wanted to rent out the place when they weren’t using it, a decision that guided the design from the start. For example, they originally specified a complex folding-door system but scrapped the idea, favoring ease of use over esoteric details. “If we were renting to someone who didn’t know how to use that, it would easily break,” Nolan explains. Nolan and Kennedy selected robust materials, such as concrete, brick, and spotted gum and tea tree wood, that are likely to hold up to a parade of renters while staying true to the firm’s signature sensibility. “Materials are a big part of the practice and what we call ‘handmade modernism’—that strength that comes from something being built by somebody, not machine-made,” Nolan says. She and Kennedy avoided fragile finishes in favor of surfaces that would weather and build character—“materials that really hold their beauty and age in a lovely way,” Nolan says. She used drywall only on the ceiling. Environmental responsibility and privacy were at the heart of Nolan, Kennedy, and Farrell’s vision. The architects optimized the structure’s orientation and ensured cross ventilation to keep heating and cooling to a minimum—and also to block views from passersby. “People park and walk around, so it feels like a little country town,” Nolan says. “It really had to be private from the get-go.” To that end, the single-story, 670-square-foot house wraps around a central courtyard, the main outdoor gathering space. Nolan and Kennedy restricted floor-to-ceiling windows to the inward-facing sections and kept most of the street side opaque. Deep eaves shield the glazing, allowing Nolan and Farrell to forgo drapes and blinds. Rooftop solar panels produce energy for the house—“Kind of a no-brainer,” Nolan says. For Nolan, Farrell, and their three children—Ignatius, Nell, and Clare—time in Merricks Beach is about togetherness and flexibility, priorities that are reflected in the open layout of their home. The kitchen, dining area, and living room flow together so that people can easily converse throughout the house. When the sliding glass doors are opened, the space merges with the courtyard and becomes an expansive indoor-outdoor room. To further the classic Australian-weekender vibe, Nolan and Farrell outfitted a spacious room with four bunk beds. “A bunk is so exciting for the kids,” Nolan says. The room, set away from the central living area, has become a secondary lounging and play area for the children, where horsing around needn’t interfere with the adults’ enjoyment. “We wanted the opportunity to have two types of living rooms because there’s often lots of kids down there, and they can very easily drive you crazy,” Nolan says.